“Basso buffo Fernando Corena, heralded as the true successor to comic bass Salvatore Baccaloni, began his career singing non-comic roles just as did the imposing Baccaloni. A gift for buffoonery, however, cleared the way for his concentration on comic roles and there it was that he achieved his reputation. Encouraged by Italian conductor Vittorio Gui, Corena traveled to Milan to study with Enrico Romani. After an unofficial début there, he returned to Switzerland for the duration of WWII, performing on radio broadcasts and appearing in opera at Zürich's Stadttheater. Corena's official début took place in Trieste in 1947, when he sang Varlaam in BORIS GODUNOV. 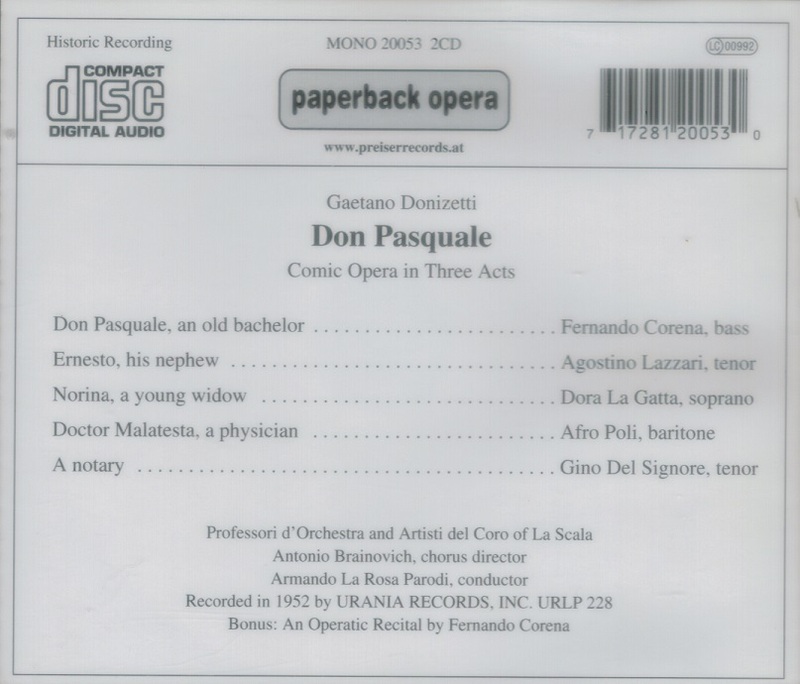 Soon, he had offers from many parts of Italy and began singing such varied dramatic roles as Sparafucile (bass), Escamillo (bass baritone), and Scarpia (baritone). In 1949, he took part in the premiere of Petrassi's IL CORDOVANO at La Scala. Although he did not fully surrender the serious bass/bass baritone repertory, he steadily moved into the buffo roles and found his career moving ever more swiftly upward. 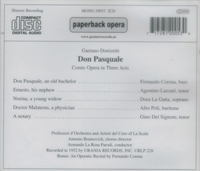 Corena's Metropolitan Opera début took place as Leporello on 6 February, 1954, and he established himself almost immediately as a favorite singer in that house. 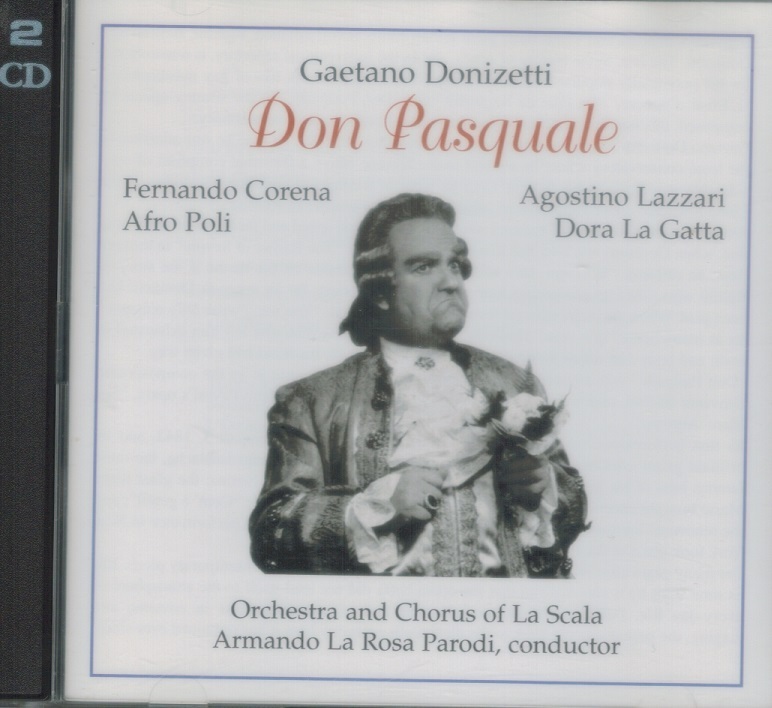 For a quarter century, he all but owned the great comic roles, creating impossible-to-forget portraits as Dulcamara, the Sacristan (TOSCA), Don Pasquale, both Bartolos, Falstaff, Melitone, Don Alfonso, Benoit, Gianni Schicchi, Sulpice, Mustafa, and Geronte. By the time he closed his Metropolitan career in 1978, he had sung 92 performances of the Sacristan alone.